Nokia started shipping its iPhone competitor N8 yesterday and reported massive pre-orders and huge demand. Now the world’s biggest cell phone seller from Finland is claiming huge success of their Ovi suite of service and the Ovi Store. Ovi Services on the Nokia Platform offers the company’s mapping facility, music, messaging and Life Tools in a good number of countries around the world. 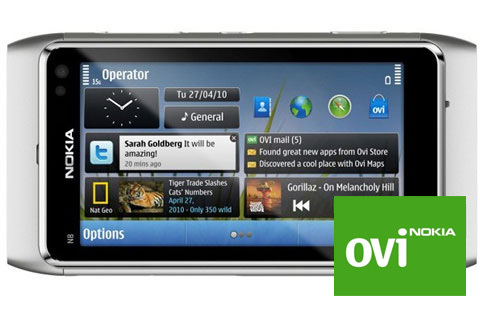 The Ovi Store is Nokia’s app store which it reports is getting huge traffic from users and developers. Nokia reports that 200,000 people are signing up to its Ovi Services every day and the number of its users from around the world has already reached 140 million. It helps that the Ovi Services are available in more than 190 countries and expected to add to the list in the coming months. These figures are obviously huge as they’re already close to beating Apple’s 160 million users and if the current trend of 200,000 users per day continues, the feat will be achieved sooner than later. Nokia’s Ovi Store is not far behind as it’s seeing 2.3 million app downloads per day from around the world. Nokia reveals that 70 app developers and publishers have crossed the million downloads milestone for their games, tools and apps in the app store, including names like Digital Chocolate, EA, Gameloft, PepsiCo, Qik and Shazam. Again, impressive figures that are a danger sign for Apple and Android. It seems like Nokia is finally waking up and trying its best to re claim its throne in the mobile market which has become obsessed with smartphones. It’s taken the first step and let’s see what it offers next to keep up and compete with existing players.